Benjamin Franklin was right. There are only two certainties in life: death and taxes. After spending hours at the Family History Library slogging through Virginia’s sparse 18th century paper trail, I’m mighty thankful for the taxman. In 1783, that man was James McCalister. He was responsible for assessing personal property tax liability for residents living in his designated district within Berkeley County, Virginia (now West Virginia). Among the men enumerated by McCalister in 1783 were Joseph Kirk and his brother John. The brothers had lived in the area for the past ten years when Joseph leased 100 acres in April 1773 from the Honorable George William Fairfax, proprietor of thousands of acres in Virginia’s Northern Neck. 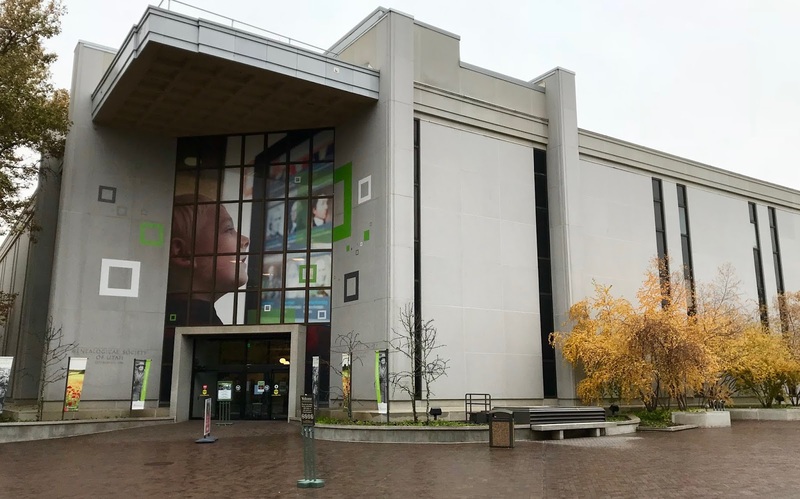 This weekend's tireless hours of research holed up in the world's preeminent genealogy library may have resulted in an opaque jackpot discovery. 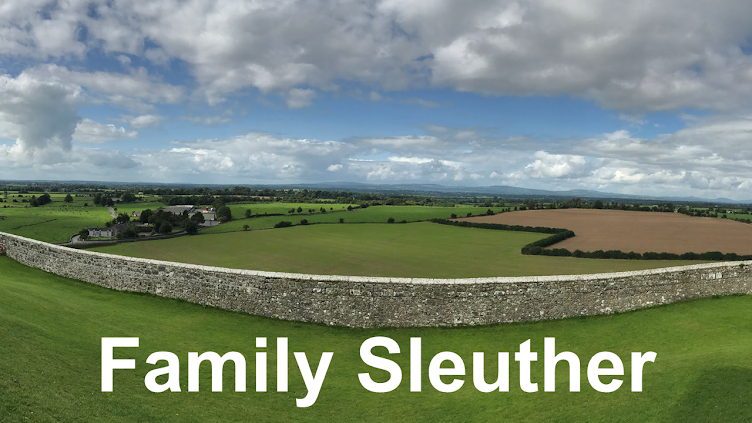 As the dust settled from my research frenzy, I found myself wondering whether I had surfaced circumstantial evidence for Thomas Kirk coming of age in the household of Joseph Kirk's widow. Berkeley County's tax records hinted at the socioeconomic status of Joseph Kirk and his brother John. 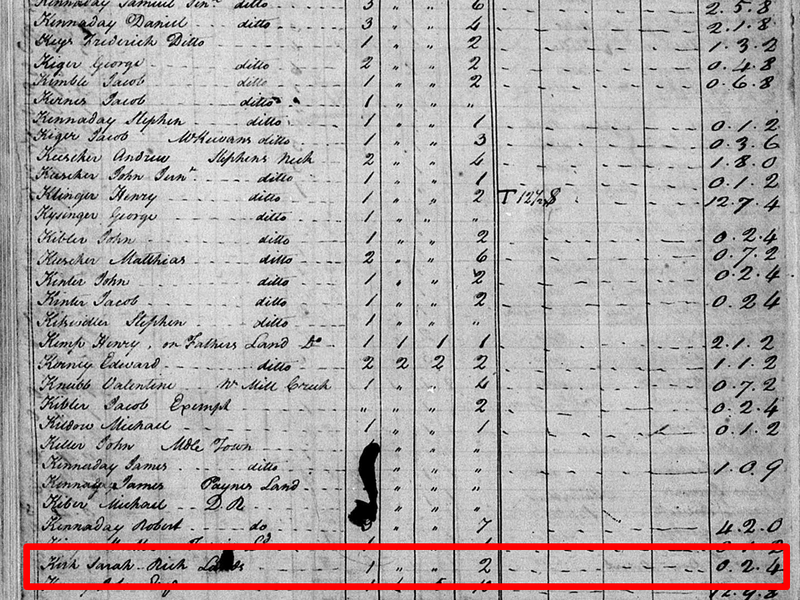 For example, both brothers appeared in Berkeley County’s 1782 personal property tax list that tallied men of voting age as well as the number of slaves owned. Joseph and John were enumerated separately – suggesting that they lived in separate homes. They were each the only voting male in their household, meaning no sons of voting age. Neither man owned slaves. Beginning in 1783, a decade after Joseph signed the land lease with Fairfax, the digitized personal property tax records pointed to his modest means. 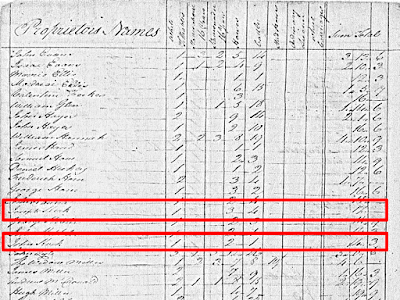 In that year, he owned 3 horses and 4 cattle for which he was assessed a 17-cent tax. His brother John owned 2 horses and 1 cow and was assessed a 14.3-cent tax. The brothers’ ownership was unchanged in 1784. Joseph paid another 17-cent tax for 3 horses and 4 cattle, and John paid his 14.3-cent tax for 2 horses and 1 cow. 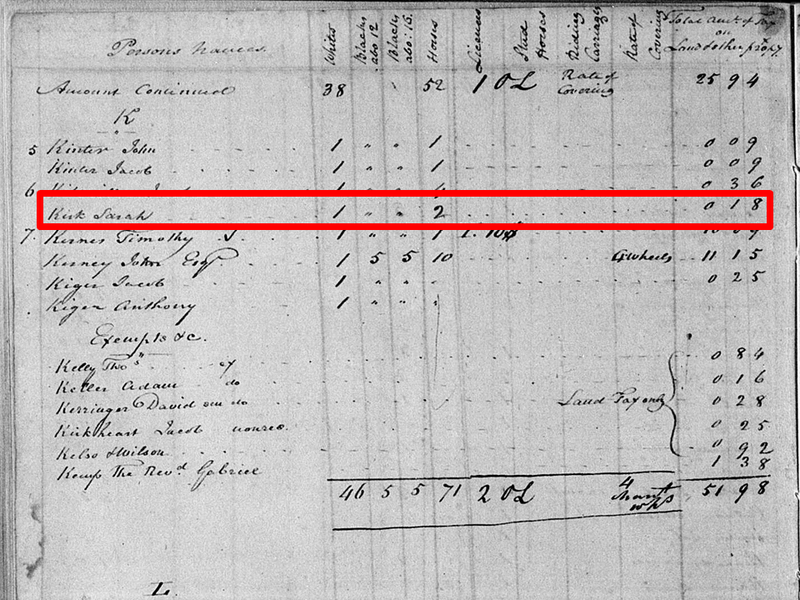 Joseph’s absence in the personal property tax records beginning in 1785. Joseph’s failure to seek remuneration in 1783 (the year he was able to do so) for the grain he gave to Colonial Revolutionary armed forces. Joseph’s wife, Sarah Kirk, appeared in court without him in 1784 on a Replevy Bond because, beginning in December 1783, they had fallen behind on rent due to Fairfax (again, see A Genealogy Cold Case Heats Up). Joseph’s absence in these key records suggests he was ailing or had passed away. In 1786, Joseph Kirk was not enumerated in McCalister’s tax district. However, his brother John Kirk was listed in a new tax district, suggesting he had moved. John appeared in Walter Baker’s tax district where he owned no horses or cattle and was assessed a 10-cent poll tax. Why the move and what happened to his livestock? 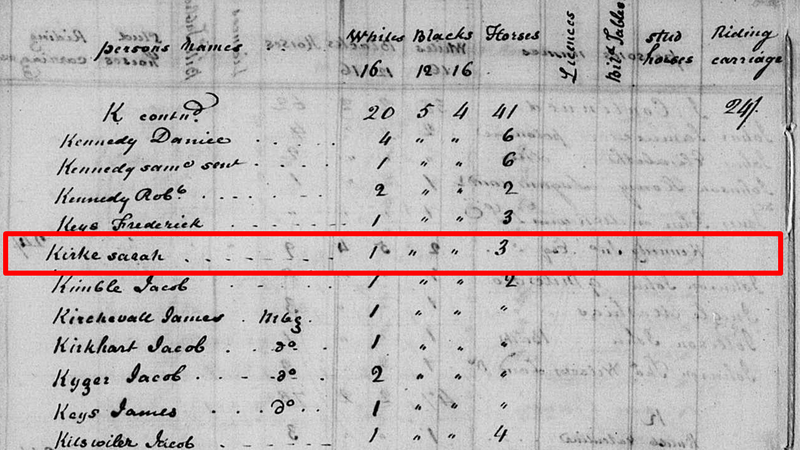 1786 was the last time John appeared in Berkeley County's tax lists by name. 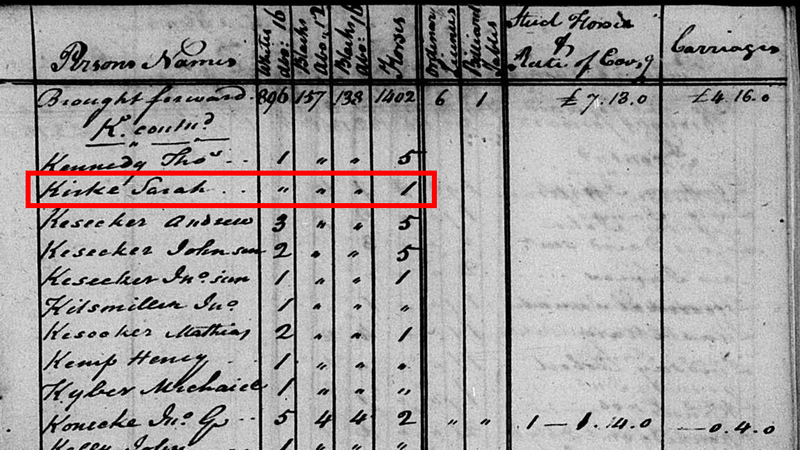 In 1787, a new name appeared on the personal property tax list: Sarah Kirk – Joseph Kirk’s widow. She had 1 horse and 2 cattle, indicating that during her household’s two-year absence from the personal property tax list, there was financial decline. This year's tax list included a potentially helpful column. The first box tallied the number of white men over the age of 21 (these would be the community’s eligible male voters). The field was blank, indicating that there were no adult men in Sarah Kirk’s 1787 household. Joseph Kirk was missing from the home. During these years, taxes were concurrently assessed on land owners. This created a second set of records that complemented the personal property tax lists. 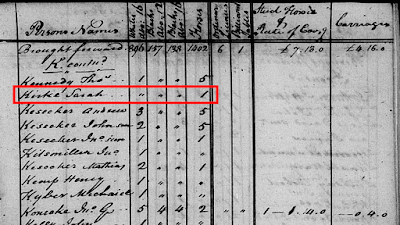 Curiously, Joseph Kirk’s name appeared on the land tax lists in 1785 through 1787 when it did not appear on the personal property tax lists. However, in 1788, the land tax list included his name followed by the abbreviation “exrs” – executors. Joseph was in fact deceased, even as his name continued to appear on the land tax list. 1788 Berkeley County, (West) Virginia Land Tax List: "Joseph Kirk's Exrs"
Having established that Joseph Kirk - the household's sole voting-age male - was deceased, provided a unique opportunity to gauge whether any men would come of age on the tax list (most likely sons growing up). Could I monitor the field denoting white men of voting age to identify whether Sarah had boys in her household who would age into adulthood? Perhaps someone matching my Thomas Kirk's demographic (age), her possible son, would make an appearance. 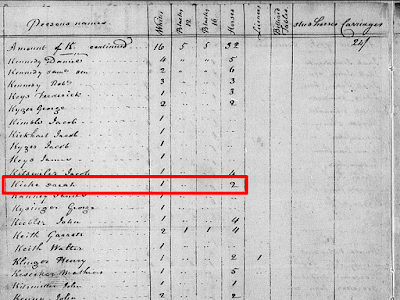 In 1792, 1794, and 1795, there were no men above the age of 16 in Sarah Kirk’s household. In 1796, that changed. A male above the age of 16 was enumerated in Sarah’s household. Subtracting 17 years (to account for the male being over the age of 16) suggested an approximate birth year of 1779. Thomas Kirk's original headstone indicated he was born in 1778 per the age at death on his now-missing headstone. Without knowing his exact birth date or which month and day that the 1796 personal property tax list was enumerated, it is impossible to determine what year the male above the age of 16 was actually born. However, he was certainly within range of Thomas Kirk’s birth. Is this the earliest known appearance of my fifth great-grandfather in the paper trail? 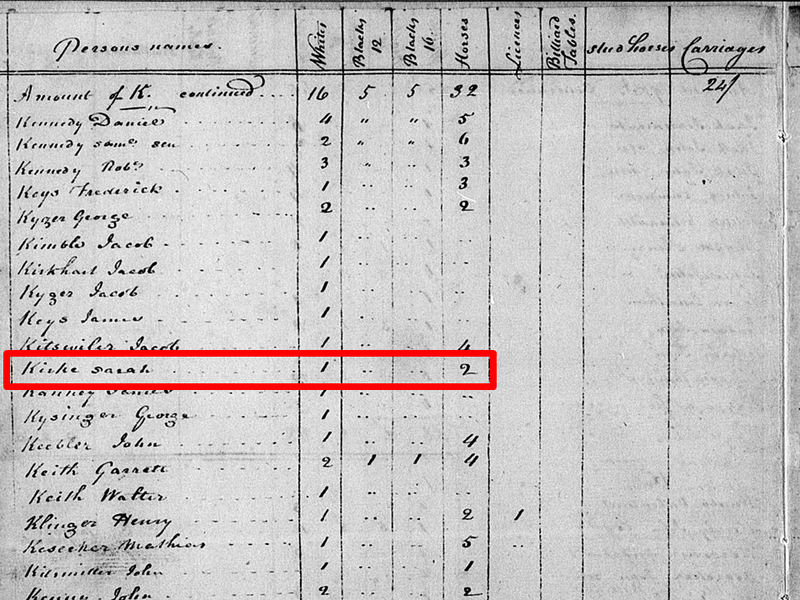 Sarah Kirk and the male above the age of 16 appeared again in the personal property tax lists for 1797, 1798, and 1799. 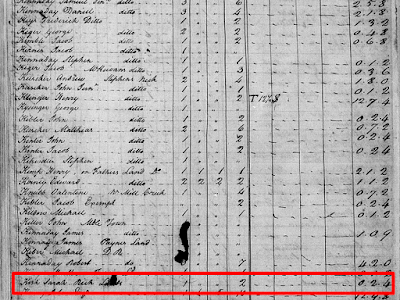 They were both missing from Berkeley County's tax lists beginning in 1800. Could It Actually Be Him?! If the voting-age male was in fact Thomas, his disappearance by 1800 dovetails nicely with the existing timeline of his life. Previous research traced Thomas Kirk to the 1799 personal property tax list in Brooke County, Virginia (now West Virginia). It was in Brooke County that his soon-to-be wife Sarah Bonar was raised, so he was expected to arrive on that scene eventually. 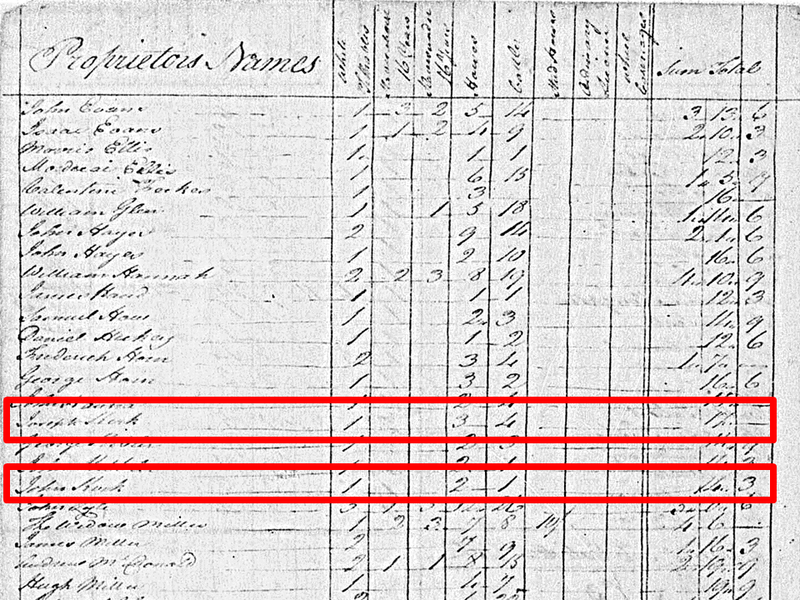 Did Thomas move west from Berkeley to Brooke County - perhaps after the death of his widowed mother - with sufficient time to appear in both counties' 1799 tax enumerations? It's possible depending on when they were each enumerated. 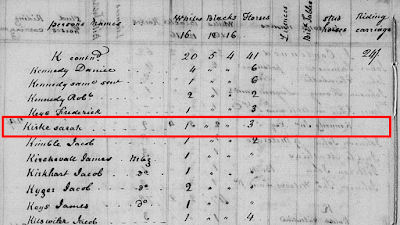 Could this voting-age male who came of age on the tax lists be Thomas Kirk? The records don't state his name explicitly, but - like a puzzle piece that fits snugly - they don't contradict this theory and only add fuel to my growing speculation that Thomas' parents were Joseph and Sarah Kirk of Berkeley County, (West) Virginia. Like I said, it's a potentially opaque jackpot discovery. Nothing is definitive. It never is in my arduous ongoing Kirk research. I've learned to interpret the shadows on the walls.